An international news agency on Sunday reported that the Indonesian police believe that the guns used in the terrorist attack in Jakarta, Indonesia originated from the Philippines. According to The Wall Street Journal report, Indonesian Police Spokesman Anton Charliyan said that 12 people arrested in the raids disclosed the information that the guns described as “well-built” came from the Philippines. Charliyan added that another nine guns seized in the counterterrorism raids in Jakarta since Thursday came from another neighboring country. On Thursday, Indonesia’s capital was attacked by suicide bombers. 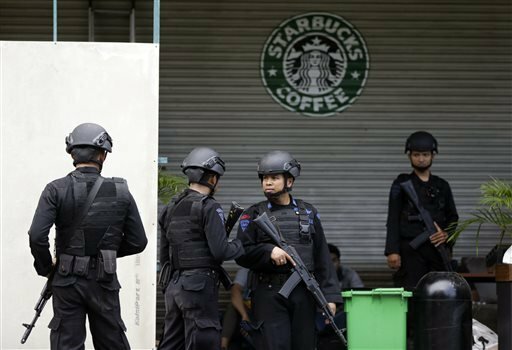 They struck at a Starbucks cafe in a shopping area and started gunfight against the police. The terror attacks claimed eight lives which allegedly include four civilians and four attackers. The terrorist group Islamic State (IS) took responsibility for the attack last Thursday via Twitter, noting that it was funded by the IS in Syria. A report of the Associated Press particularly mentioned that the IS attack was funded through an Indonesian who spent a year in jail for illegal possession of weapons in 2011. He was identified by National Police Chief General of Indonesia Badrodin Haita as Bahrun Naim. Meanwhile, a radio report said that the Philippine National Police will conduct an investigation regarding the report that the guns used in Jakarta attacks came from the Philippines. As of late, there are no intelligence report confirming that the guns were indeed originating in the country.